The Hubs had a birthday this weekend, we partied. I needed a few desserts for our little shindig, so I ended up making a kid dessert and a grown-up dessert. As always, simple and easy is the way I roll. “Older Than Dirt”: You’ve done this before- just chocolate pudding, crushed oreos, and gummy worms. In case you are wondering, this was the kid dessert. Love that font? Me too. Its called “Digs My Heart” and it’s free. You’re welcome. 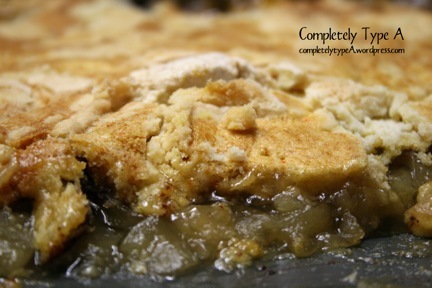 Apple Pie Dump Cake: two cans of apple pie filling in a 9×13 pan, sprinkle cinnamon then sprinkle a yellow mix, then top with one cube of butter cut in slices and divided all over the top. Cook 350 for 30-40 minutes (until pie filing is bubbling and top is browned). My friend, Jill, always makes this, and its so yummy. She says you can use any kind of fruit pie filling. I’ve tried marion berry before and it was a little runny. Apple is our favorite so far.